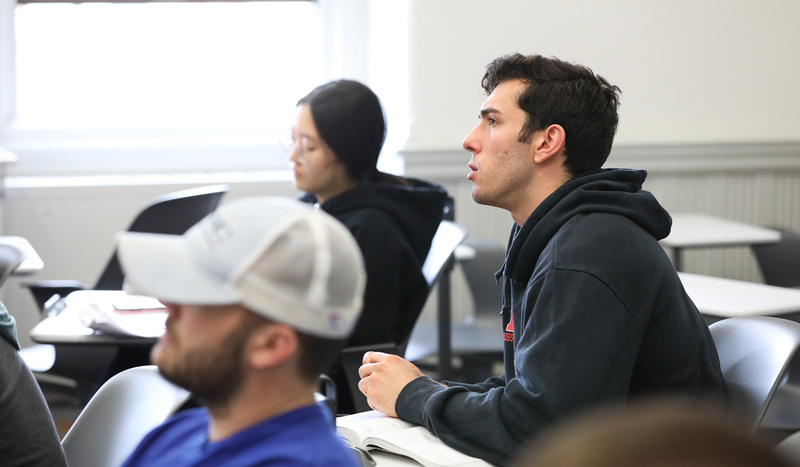 With rigorous courses in investment analysis, options and futures, financial markets, financial statement analysis, and corporate finance, this program is designed to prepare students for careers managing the finances of both profit and non-profit organizations as well as serving the needs of the financial services industry as a securities analyst or broker. Students majoring in finance will complete the degree requirements for the Bachelor of Science in Business Administration (B.S.B.A.) in Finance. Major Requirements: To earn a Bachelor of Science in Business Administration (B.S.B.A.) in Finance, students must complete 22 business and economics courses. This includes: 11 core courses (in introductory accounting, economics, management, business law, and ethics); 4 finance concentration courses; 4 Math/Computer Science/Statistics courses; and 3 business and economics electives. University Requirements: Students must also complete the core University requirements, specific to their major, in order to complete their degree. Finance students are required to complete 18 courses in addition to their business and economics courses. These courses include: philosophy, theology, humanities, literature, writing and composition, and free electives. Study Abroad: Students majoring in finance are encouraged to broaden their educational experience by spending a semester studying abroad. The study abroad opportunity in Rome, Italy, is one particular location that is oriented towards business majors. The key to studying abroad while pursuing a Bachelor of Science in Business Administration, is to plan ahead. Schedule a meeting with your academic advisor, and also visit the CUAbroad office. Internships: An internship is a unique academic opportunity that allows students to step out of the classroom and gain real-world experience in a professional setting. Possibilities such as the U.S. Department of State, Wells Fargo Advisors, and Wachovia Securities are all local internship opportunities that our finance students have filled. Minor Programs: Students majoring in finance have a wide variety of minors available to them and may choose from disciplines offered across the University. Popular choices for finance majors are: foreign languages, politics, or philosophy. However, students majoring in finance may not minor in a business discipline. Full list of minors within the School of Arts & Sciences. Popular career paths for recent graduates with a finance degree include financial analyst, business analyst, sales representative, investment banker, accountant, and financial advisor. Trips and Field Study: Finance majors have the opportunity to apply to the CUA on Wall Street program, which gives students access to CUA alumni who are currently employed on Wall Street. Students who participate travel to New York City on an annual trip to learn more about their prospective career and network with valuable contacts.